Hands up how many people know you can have a stroke due to dehydration? Dustin Freckleton, a medical student at the University of Texas and a healthy 24-year old found out this was possible in the harshest way possible. "Getting ready in the morning for a 16 hour day of study I looked down and my left ankle had internally rotated," Freckleton told us. "So I was basically standing on the side of my foot. It took me considerable effort to strengthen it back out. Over the course of the next 45 seconds I felt all the strength drain away from the left side of my body. I felt paralysed. I couldn't wiggle a finger or a toe for the next couple of weeks." Fortunately, being a medical student at one of the largest medical centres in the world, Freckleton, who was studying to be a physician, knew he was having a stroke. He was immediately rushed to the emergency room and spent the next three months trying to learn to walk again. After dozens of visits and studies, he was able to uncover that the stroke was as a result of an acute case of severe dehydration. "I had no clue that dehydration could cause that. To me that was just insane. Dehydration is something that could happen to anybody. Why would it cause a stroke? It kicked off a lot of thinking in my mind. First off, why did my body not warn me about this?" Freckleton spent the rest of his medical education gathering lab research to find a technology that could prevent a situation like his to happen to somebody else. Using technology that was being used in an intensive care unit (that actually didn't measure hydration), the science underlying it was in line with what he needed. That technology was spun into a company we now know as BSX Athletics and its founder and CEO has spent the past four years obsessing over this problem: how to measure hydration. That leads us to LVL, a wrist worn wearable that can monitor hydration as well as track fitness, heart rate and sleep quality. It's a joint venture with global design and strategy company Frog which has plenty of expertise in the wearable field having worked on the Ticwatch 2 smartwatch and an open source VR headset for hospital patients. The Kickstarter campaign has raised just under $1 million and there's still days left to run for prospective backers to show their support. But why is hydration such a big deal? No major fitness tracking company has as yet looked at the idea of measuring it before. "Hydration matters for anyone that sweats and that's everybody," Freckleton explained. "Our bodies are primarily water. Everything from exercise to better sleep, weight management, to better mood. All of that comes back to hydration. Hydration is one of the most primal instincts we have as human beings. You can go a lot longer without food than you can without fluid. "We can identify when the body is hydrating and dehydrating," he continued. "We map the dehydrating and hydrating experience to events within a users day that are particularly prone to dehydration. The two events we tie that to is exercise and sleep." Improving sleep quality is just one of the areas the LVL hopes to help provide meaningful actionable data. For the team, making the device comfortable to wear in bed was crucial. It didn't want a big, bulky wearable that shone bright green lights like the Fitbits, Apple Watch and Garmins. "We want people to have the best night's sleep possible. So several hours before you go to bed we measure and we are able to tell you that you are about 23 oz low right now. Based on your previous night of wear we can see that you are 33% more likely to sleep better tonight if you drink that right now and go to bed fully hydrated." BSX has carried out clinical studies in Austin where it measured hydration and the effects of hydration in research subjects. "We recently concluded a study that participants who went to bed dehydrated to a mild extent by only 1-2%, recorded a 40% poorer sleep quality that night." Freckleton also believes there's much more you can learn by monitoring hydration on a regular basis. "We wanted to know what dehydration could do to cognitive performance, earning potential, the ability to function during the day," he explained. "One of the things that stood out most to me was the discovery that verbal recall, the ability to hold words in one's short term memory decreased by 51% due to mild dehydration. "We surmise as a research group that when your body is dehydrated, it goes into survival mode, where only activities that are core to the survival of the organism are prioritised over all other things. Remembering words is not core to survival. When it comes to weight management it's huge as well. Our thirst drive and hunger drive are very often confused. People often eat when they should be drinking." The obvious application is when you're exercising. Two years ago BSX shipped a product that was aimed at high performance athletes to quantify fitness capacity. The LVL wants to be a workout aid too and there's plenty that users will be able to benefit from when they strap it onto their wrist before jumping into the gym or going out for a run. The focus here is the effect of hydration on performance. "You can perform better in your workout today or in your race if you start hydrated. We can tell you during a workout you're sweating because of how hot it is, how humid it is, how hard you're training. In order to stay properly hydrated we make suggestions on an hourly basis to sustain that effort. We try to tie the data in with the action so that it's clear to the user what they need to do to get the most out of the body whether that's sleep, exercise or daily freshness." At the heart of the LVL is its optical technology. There's plenty of wearables that use the same method of measuring biometric data from the wrist, but it's the decision to opt for red light based sensor technology over the green light tech used by Apple, Fitbit, Garmin and Polar that's the real talking point here. LVL uses red light which has been tuned to be able to recognise the water signals at various depths of the body to measure the hydration. "One of the core reasons we invested in BSX is we think the optical sensing platform that BSX has is going to set the new benchmarks for what wearables in the future will be measured against," David Carr, associate strategy director at Frog told us. "The red light technology enables optical sensing, particularly for heart rate that's vastly more accurate than anything else on the market today. That's one of the biggest complaints about the green light technology. That's really just scratching the surface of what the red technology can do. Using the longer wavelengths, we can move the signals much deeper inside of the body and we can see more interesting signals." Freckleton is keen to wade into the green light, red light debate as well calling the accuracy of green light monitoring "incredibly poor". 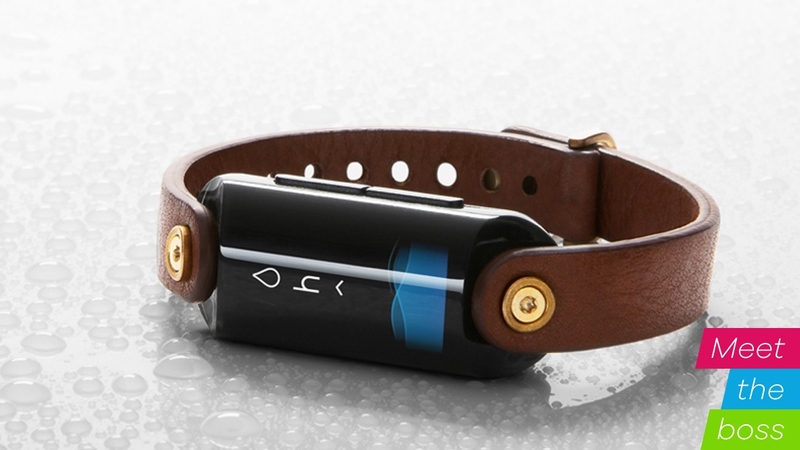 He also believes that it's unfortunate that it's becoming such a stable in wearable devices. But change is coming and the main wearable players are realising this too. "What's exciting to me is that we are getting companies like Apple putting red light into sensors into the Apple Watch. They are not using it yet, but they are starting to put that hardware in there collecting the data. Garmin is doing exactly the same thing with their watches. "You look at most wearables, they are plus or minus 14-20 bpm of what an EKG gold standard can show. We've been able to demonstrate with a full range of activities from low to high intensity an accuracy of 2.7 bpm." So what's next for LVL? While BSX and Frog plan to ship the wearable hydration monitor in June 2017, it's already looking to the capabilities of what its technology could offer in the future. "It's predicted by 2017, 90% of wearable shipments will include optical sensors," Freckleton told us. "Optical sensors are so powerful because they have that ability to non invasively measure things in the body. These biosignals are far more important than the mechanical signals that we are currently measuring like the simple steps. "It actually reflects what the body is trying to tell us, things it's saying but we can't hear. Having a robust optical platform that can not only measure heart rate and hydration, but can measure oxygen status or respiratory rate, allowing us to be able understand more in real time about the body."